24715 Oak Creek Avenue, Newhall, CA. If you were a fan of singing cowboy Gene Autry, then the name "Melody Ranch" will raise fond memories of Gene and Smiley singing songs around the campfire. Gene's radio show was named "Melody Ranch," but a real Melody Ranch actually exists - a movie studio ranch in the hills north of L.A., where they shot most of Gene Autry's western adventures. And at least once a year, you can tour Melody Ranch, a colorful bit of Old Hollywood. Melody Ranch started out as Monogram Studios Western filming site in the 30's & 40's, where hundreds of movies and classic TV westerns were shot, including 35 different John Wayne movies. The studio began back in 1915. 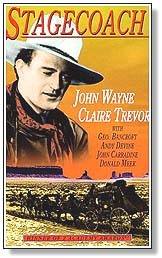 In 1939, its Old West town served as the location for the finale of the John Wayne classic, "Stagecoach." 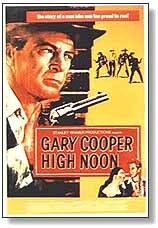 In 1952, Gary Cooper shot it out with the bad guys in the unforgettable "High Noon". Gene Autry had shot many of his early Republic westerns here, including his first film, "Tumbling Tumbleweeds." When the original owner died in 1952 and Monogram Studios went out of business, Gene bought the ranch, leasing its dusty streets and Old West buildings to various TV production crews for classic TV westerns such as "The Lone Ranger," "Gunsmoke," "Wyatt Earp," "Hopalong Cassidy," "Red Rider," and "Wild Bill Hiccock." He also produced shows of his own here, as part of his company, Flying A Pictures, including "Annie Oakley." That is, until 1962, when a major fire in Placerita Canyon destroyed much of the studio. Elvis Presley was on location here at the time, shooting "Kissin’ Cousins," and helped fight the fire. Over the years, the Autrys sold off most of the ranch property, reducing it down to just 10 remaining acres, where the Western buildings stood, which he kept as a pasture for his loyal movie horse Champion III. He sold the remaining 10 acres when Champion III died and was buried there. Gene moved his large collection of Western memorabilia to his new Gene Autry Museum. Fortunately, the Western town has been saved by the new owners who bought the ranch in 1991 and restored to its former glory . The ranch is once again being today used for making movies; one recent production at Melody Ranch starred Jeff Bridges in 1995's "Wild Bill" (where it stood in for Deadwood, South Dakota) and "Sunset" with Bruce Willis and James Garner. They shot the CBS TV series, "The Magnificent Seven" at Melody Ranch, and even more recently they shot the highly acclaimed HBO series, "Deadwood" at the ranch. Melody Ranch is a privately owned movie studio, and the public usually isn't admitted. But they have recently begun offering VIP tours. They have recently opened a new Melody Ranch Motion Picture Museum, which is housed in the old Hacienda on Old West street, and a private tour includes both the museum and the Western streets. Tours require advance reservations. (At last word, it cost $40 per person.) To make a reservation, phone (661) 286-1188. Melody Ranch also now has its own website, at www.melodyranchstudio.com. There is also another way to visit the historic ranch. On one weekend each year, in late March (or early April), they hold the annual Cowboy Festival here at Melody Ranch (and at the adjacent William S. Hart estate). The festival includes trail rides, chuck wagon meals, cowboy shopping, and assorted shows by cowboy crooners from seven western states and Canada. (such as Don Edwards, Baxter Black and Riders in the Sky), staged at the Melody Ranch theater and the Hart mansion. In 2015, the 22nd annual Festival will be held on April 15-19. Important: For the first time, due to filming at Melody Ranch this year, the Festival won't take place at Melody Ranch, and will instead take place in Old Town Newhall and Hart Park. There is no on-site parking at Melody Ranch. Shuttle buses take ticket holders from a parking area off 13th Street to Melody Ranch. Admission is $20 for adult and $10 for children (or $30 for a two-day pass). For more information about the Festival, call (800) 305-0755 (for the hotline) or (661) 250-3735, or go to www.cowboyfestival.org. Getting there: Melody Ranch is located far from Hollywood, north of the San Fernando Valley, in Newhall (near Santa Clarita), a few miles southeast of the Magic Mountain theme park. From Hollywood, take the Hollywood Freeway north through the Valley (about eight miles), to where it merges into the Golden State (5) Freeway. Take the Golden State Freeway north (for about seven miles), to were it intersects with the Antelope Valley (14) Freeway. Branch off on the Antelope Valley freeway and go about three more miles north to the Placerita Canyon Road exit. Turn left on Placerita Canyon Road, and head west (just over a mile) to the studio gate on Oakcreek Avenue.